Tag Archive | "Advanced Photoshop Magazine"
Issue 67 of Advanced Photoshop magazine is now out and features a career-guide article entitled So You Want To Be A Vinyl Toy Designer featuring Genshi Media Group founder and toy designer Craig Anthony Perkins. Craig answers questions and gives insight on the industry, the tools and his own experience as an indie toy designer with his toy label GENSHI:TOY. 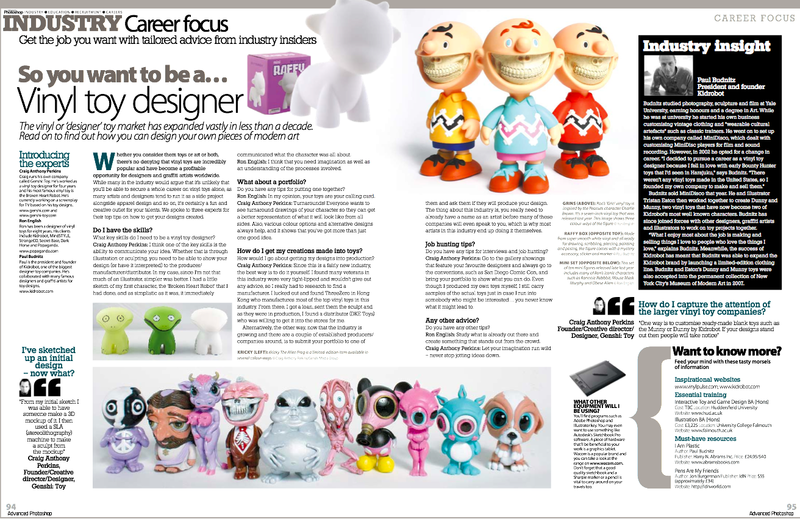 The article also features prolific lowbrow artist Ron English and Kidrobot founder Paul Budnitz. Check your local newsstand for this issue of Advanced Photoshop – The magazine for Adobe® Photoshop professionals.